You know I've been working on the sequel to Precisely Terminated for awhile, right? Anyway, since it's the second book in the Cantral Chronicles trilogy I've just been calling it CC2, because I didn't have a title yet. I didn't have a title for months, and since PT's release date is drawing in fast, I was starting to feel a little anxious about this lack of a title for its sequel. It's kind of good to be able to tell people what the sequel will be called! So my dad and I brain stormed for a bit and came up with the title. In the months of September, October, and November, I will be away from my home almost the entire time. Well, I'll tell you anyway. 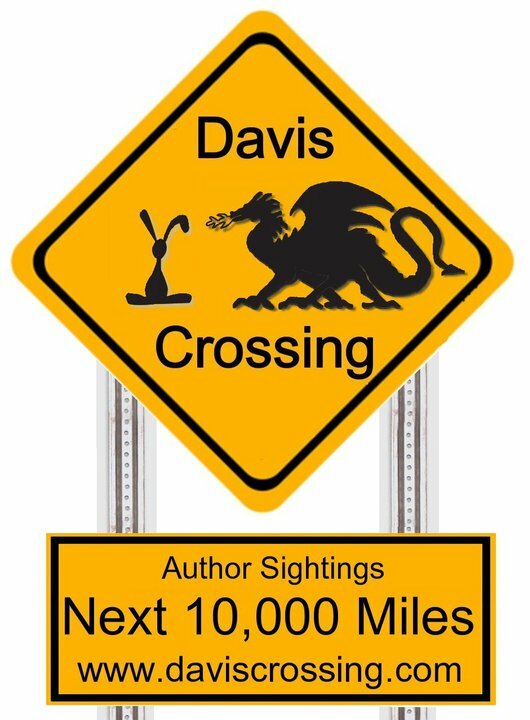 My dad, author Bryan Davis, and I will be going on a tour across the country (and a wee bit into Canada) on a promotional tour. Some dates are scheduled, some are still tentative, but we will be driving a total of about 10,000 miles and visiting many states, from the east coast, northern border, mid west, west coast, and up into British Columbia. When I have a specific schedule, I'll post it here. Meanwhile, we're busy with preparations. One of which includes coming up with a tour logo. My dad and I brain stormed yesterday and came up with an idea to use a road sign and other things. So last night and this morning I worked on a logo that we will be using on the side of our van as a magnetic sign. We also might get t-shirts. We'll see. The dragon is the representation for my dad, since he writes dragon books. The bunny is for me because ... well... because my family often calls me a bunny, and I call myself that, too, and bunnies are just adorable. Every year around July or so an event is held called the International Retail Show (ICRS). It was held in Georgia this year. This is a convention of booksellers and bookstore owners who gather to meet and discuss various things and sell and buy books for the year. Authors are invited as well as incentive for bookstore owners to come and buy more books. Apparently, they like meeting authors. I've been to almost every ICRS since 2004 (I've missed one or two here and there), despite the fact that I wasn't an author until this year. My dad started going long before 2004 as a media person and then as an author in '04. This year it was my turn to go as an author. Though Precisely Terminated isn't out yet and won't be until October, my publisher decided to print about 50 advanced reader copies (ARCs) to have for the book buyers to pick up and take so they have an idea what the book is about and are more likely to buy it to stock in their stores once it is out. So we had a book signing and all the books were picked up. This was Monday, July 11, the first day of ICRS. Here are some pictures from the signing. Please note that the cover that you see on the ARCs is not the final cover. There will be a completely different cover on PT when it is released. When I have the final cover, I will post it here. After the signing I was informed that Roma Downey, the actress who plays Monica in Touched By An Angel was at ICRS and signing posters for some DVD thing she was doing, so we met her, and I had my picture taken with her. And no, Monica from Precisely Terminated did not get her name from this Monica. On Tuesday the 12th I had two interviews with two magazines and a talk with my publicist, and after that we drove home to Tennessee. In Precisely Terminated the main character, Monica, has to wear a small glass vial with a computer chip in it around her neck. This is so she can infiltrate various places and to keep the Nobles from knowing she doesn't have a chip of her own. I decided I wanted this same type of necklace for myself. 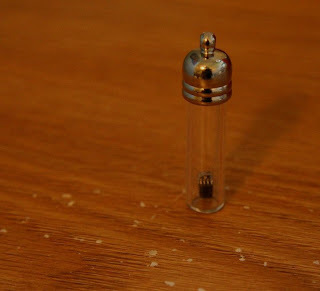 I ordered some small (1 inch tall) glass vials from etsy and cut up an old piece of RAM (a computer memory chip) and inserted the cut piece into the vial. I'll soon find a string to thread through the hole and the necklace will be complete. I'm glad the computer chip doesn't run like the ones in the story! I had my second speaking even ever on the 1st. My dad was invited to a conference to speak, and the conference directors had me speak for ten minutes or so. It was a short time, but I'm not very practiced at speeches yet, anyway so I did not mind at all. Next event I have is a book signing at the annual Christian book seller's convention (ICRS - International Christian Retail Show). I also have some interviews there, and my dad has a signing as well.